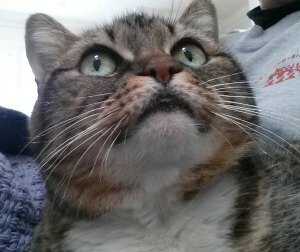 other potential problems from the 'nip." Some cat "owners" worry about catnip addiction and about giving their kitties too much of the herb. They see their feline friends going nearly crazy when they smell or eat the herb, but what is really going on? Catnip causes a euphoric reaction in only 50% to 70% of all felines. Other cats are seemingly immune to its drug-like effects. Whether you give your kitty a pinch or two of crushed catnip leaves or give her the herb in a toy, the reaction will be the same. Kittens usually don't react at all until they're about six months old. It's the smell of the catnip that makes your kitty "high." The quality and potency of the leaves will also influence the reaction. Cats are more likely to react to organic catnip as it contains a higher concentration of the part of the catnip plant felines react to (Nepetalactone). In fact, it's the pesticides in non-organic catnip that could be hazardous to your cat's health. Catnip is not addictive or habit-forming to your cat. If anything, your cat may become bored or immune to it if he or she is exposed to it too often. As a matter of fact, regular "doses" of catnip can be beneficial to your cat's health and will help to keep your kitty from eating other plants in your home. So, there's no need to worry about a catnip addiction. While most cats like to roll in catnip or on a catnip toy, some like to eat the leaves. This is mostly safe for your cat. Your kitty's stomach may be sensitive to large quantities and she may start vomiting or have diarrhea. If this happens, try putting out less catnip or using catnip toys. This will allow your cat to have the pleasure, but prevent her from eating the leaves. On rare occasion, some cats may have an allergic reaction to catnip. 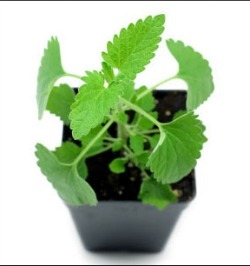 Organic catnip leaves probably cause less allergic reactions, especially since there are no pesticides involved. When first giving your kitty the herb or a catnip toy to play with, you should watch to see what kind of reaction he or she has. At the extreme, if your cat becomes unconscious or has seizures, contact your veterinarian immediately, as this is a sign that something is definitely wrong. Some cats may react aggressively when they are "high" on catnip. If you have more than one cat, it's a good idea to give them catnip separately to gauge their reactions. If things seem OK, then let them play together. It will heighten their fun and playtime. Cats who have an aggressive response to the herb may also act aggressively towards people, so be careful until you know what the reaction is like. A small level of aggression can be tolerated. Just be sure to supervise and don't let it get out of hand. Even if your cat is one who adores this herb, a catnip addiction is nothing to worry about. Felines do not become addicted to it. If you watch your cat for any other negative reactions when you first introduce it, then you'll know what precautions to take when letting your feline companion enjoy it. If your kitty is one of the many who are positively affected by catnip, then this can be a wonderful treat for your cat. It can also provide you with a wonderfully entertaining show! Catnip Plants - How to grow your own catnip plants for the best quality herb for your healthy kitty.